When you think Christmas, most of us think about decorative lights, trees, friends & family parties, gifts and most of all, VACATION! Let’s not forget that the holiday season is also about giving. Not everyone gets to experience the magic of Christmas especially those who are less fortunate or have come up on hard times. To help share and spread a little Christmas spirit, we decided to donate over 20 Santa Bags to Mercy House of Orange County. With just a little bit of time spent on creating these bags, I hope it brings a little bit of holiday cheer and hope to these children. But most of all, I hope it reminds them that Santa didn’t forget about them. Check out the unique design of each child's name below. Here are some photos of the bags under the Christmas tree along with some awesome volunteers that helped in filling the bags with gifts for the kids. We want to wish you all a Merry Christmas, Happy Holidays and we look forward to seeing you all in 2018! We had a great time at the Marshal Academy Boutique today at Long Beach, CA. It's always awesome to meet new vendors at a new venue. Thank you to all who supported our crafting/design business. 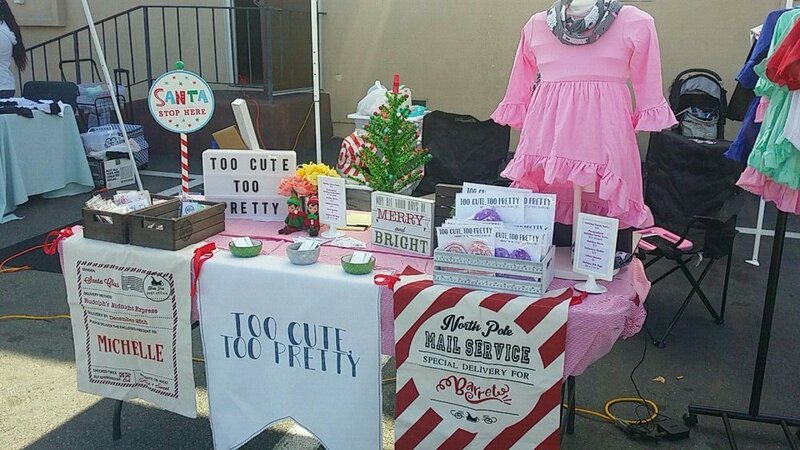 Here's some pictures of our booth and even a sneak peek at some of our holiday shirts. Join us this weekend as we kick off our holiday craft fair extravaganza. Saturday, November 11, will be our first craft fair. Join us at the Westminster Farmer's and Artist Market located at Hope Community Church between 10 am - 2 pm. We will have holiday/Santa bags available as well as some new stuff being shown for the first time! Stop by and say hi and try your luck at one of the raffles from the vendors. Sunday, November 12, we will be at Saint Irenaeus for our annual Christmas Boutique. The boutique opens at 9 am - 3 pm. We will be located inside the hall this year. If you are interested in some holiday gifts, custom Santa bags, or even some LuLaRoe clothing, stop by and check out our booths. More prototypes I just finished making. I have a few other monster face designs as well but you get the idea. Please note that the white parts are glow in the dark. *There are some slight errors in these sample bags which should will not be in the final bags. Here's a shot of the back of the bags. Only the names are also glow in the dark but the text above it do not. I know I'm late bringing these guys out but better late than never. I have other designs in the works as well as other monster faces. I just hope I find time to make samples of them. I got the design on the actual fabric. Testing went by pretty smoothly. Not too many issues and not as difficult as the previous tests I had a few weeks ago. Anyone interested in Halloween/Trick or Treat bags for their little ones? We can add your child's name at the bottom similar to how our Christmas bags were created. I will have other designs to post in the next few days as well. Here are other designs I placed on a onesie and shirt. Our creative minds are running non-stop around this time of the year. Here's a peek at one of our new holiday projects we have available with only limited quantities. The Santa Sacks are available in 4 different designs as seen above. Each Santa Sack is made from a durable canvas fabric and measures at about 19 inch wide by 26.5 inches long. We are also able to personalize each Santa Sack by putting in your child's name (or your name) on the sack as well. We have a variety of colors to match and even special glitter colors. Unlike many of our competition who are limited to the bland fonts that we have seen before, we pride ourselves with a large variety of unique custom designed typefaces to make sure that each design is unique and fitting. Currently the only way to order the Santa Sacks is contacting us via social media or email. You can message us on Facebook or use our Contact page to email us directly. Lastly, we just wanted to wish everyone a safe and happy holidays. We are excited to see you all in 2017! Just a reminder that we will be at the Saint Irenaeus Craft Fair tomorrow Sunday, November 6. Check out some NEW Too Cute Candles scents. We also restocked your favorites and we still have our holiday line of candles available. Craft fair hours are from 9am to 3pm. As always, we will have a craft fair special pricing on candles: Buy 3 Get 1 Free! Come by and support your local artists and small businesses. Breaking Out with a Lollipop! We are very excited to announce that we got accepted to our very first craft fair! 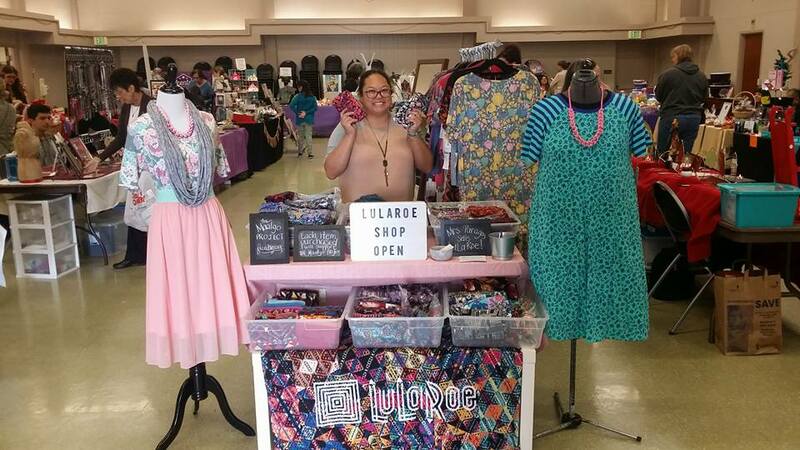 Visit us on Saturday, October 15, from 9:00 a.m. – 3:00 p.m. for Lakewood’s 24th Annual Lollipop Lane Craft Boutique in Mayfair Park. Come by and meet us at our booth (Booth #39) as we will have a special sale for our guests. Admission is free and there will be over 100 artists to show their skills. Parking is limited, however there will be shuttle service that runs from City Hall’s east parking lot from 9:00 a.m. – 3:30 p.m. For more information visit www.lakewoodcity.org or call (562) 866-9771, ext 2408 or (562) 866-4776 on the day of the event. We've been hard at work over this passed week to make an October deadline. A lot of progress has been made and we can't wait to show everyone what we have created so far. We even have a few other things projected down the pipeline that we are really eager to do. New photo booth studio kit for taking pictures of our various project for you all to see. Hopefully it gives a nice professional look to everything we make. Halloween is my favorite time of the year and the next holiday we have our eyes set on. As the holidays get closer, be sure to check out our exclusive seasonal items as they are up only for a limited time and quantity. This spooky yet baby-friendly pattern glows in the dark. Made exclusively from TCTP and will be up in limited quantities. I finally got around to installing Leslie's new toy, the Silhouette Cameo 2. I'm anxious to see what other projects we can create using this new die cutter. We also own a Pazzles die cutter we purchased a few years back. As of right now, I haven't had enough time with the Cameo to make an in depth comparison. With the little time I spent with the Cameo, I can honestly say that I do like the experience thus far. Software is probably the single most important key to any new machine I use. Since I am a primary Adobe user, it's mandatory that any new software I use is compatible to Illustrator or vector files. One added feature that the Cameo has over the Pazzles is that there is a plug-in software (Cameo Connect) that can seamlessly take you from Illustrator directly to the Cameo software and begin cutting. This can make it a breeze for those who want to transition directly from Illustrator without going thru the hassle of learning too much of another software. At this point, I have NOT used this plug-in and have only seen it being used on YouTube, but it does look promising. It is not mandatory to purchase and use this plug-in to cut your Illustrator art work as I have demonstrated below. Within a few minutes, I managed to cut out our logos I created in Illustrator WITHOUT the Cameo Connect plug-in. When it came to importing vector files into the Pazzles software, it was much more daunting to say the least. Being a relentless tech-guy and after many hours of troubleshooting, I eventually found a way to import my .eps files into Pazzles. I wouldn't recommend this to the average crafter/user unless you are well versed with converting files and saving your designs in a specific format. There were so many steps to successfully creating a compatible file that I had to create a .txt file with detailed instructions in case I forgot. Cut using the Cameo using standard copy paper. Lines were crisp and clean enough for our use. Overall I would recommend the Silhouette over the Pazzles just based on it's compatibility to Illustrator alone. I'm not sure at the point of writing this blog if Pazzles has updated to a new version of their software or even a new machine that works in conjunction with Illustrator, but I wouldn't even bother. I believe the Silhouette Cameo is crafter's weapon of choice when it comes to home use die cutting machines. For what it's worth, I'd rate it a "Must Buy" for any serious crafter or artist looking for a die cut machine. Our Cameo came with additional goodies that I have yet to open such as these sketch pens. I'll be looking at more tutorials of advance functions to see what other projects we can create. Stay tuned for upcoming projects with the Silhouette Cameo. Instead of getting a store bought gift, I decided to make these for a good friend of mine. I thought these would be perfect since they have a Mario Brothers theme going with their two sons. They turned out pretty awesome if I do say so myself.